This is not a commercial endorsement for the brand name "MaxxAir" but that seems to be the name that everyone recognizes and use to describe this product. If you find a similar third party manufacturer, by all means these following statements would probably also apply. It's as simple as this: this is one product the Winnebago should already have installed on the standard vehicle when it leaves the factory. I'm quite surprised that Winnebago has not yet chosen to do so because with their own roto-cast plastic molding machines, they could very well make this item themselves. This item is merely a plastic shroud that mounts over the top of your existing roof vent. As you know (or should know) you can not travel down the road with this roof vent opened up. Otherwise the flimsy plastic material will crack due to the wind created while traveling. In addition, if you are stationary and it is raining outside, you need to have the roof vent closed in order to keep the rain out. 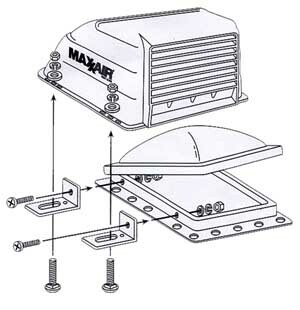 The "MaxxAir" roof vent cover solves all those problems. You can travel down the road with your roof vent open and you can keep it open while it rains.